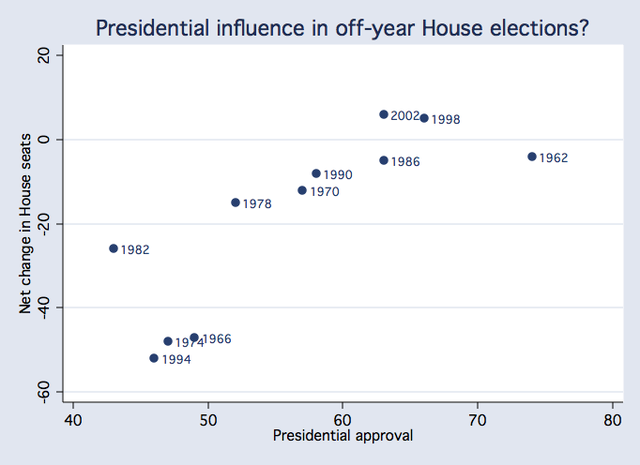 This changing relationship is what we would expect from the political science literature, which suggests that House elections have become increasingly less competitive over time, weakening the swings we observe in elections. Abramowitz, Alexander and Gunning report that "the reelection rate of incumbents and the reelection rate of House incumbents has increased from 87 percent between 1946 and 1950 to 94 percent between 1952 and 1980, 97 percent between 1982 and 2000, and 99 percent in the 2002-2004 elections" (PDF). [Republican pollster Bill] McInturff stressed that the political dynamics leading to this statistical relationship are much less present now than in past cycles. Among the notable differences: the ability to use issue advocacy money in Congressional races that was not legally available to Democrats in 1994, and the post-2000 redistricting that lead to a large increase in safe seats. And with just 18 House seats carried by the 2004 Democratic presidential nominee to defend and a GOP base that continues to approve of Bush's job performance to the tune of 81 percent, Republicans are actually in pretty good shape heading into 2006, McInturff said. ...[Democratic pollster Geoff] Garin, without disputing McInturff's caveats, said the predictor could be more accurate in 2006 because the Republicans control both the executive and legislative branches of government. "Party control of Congress is not usually an important consideration in peoples' minds," he said. "But when people feel the country is going in the wrong direction, and one-party control is the explanation people bring to bear for that, then the issue of presidential approval ratings gets heightened in importance." What does this imply about the fate of Republicans in the 2006 election? Well, we can only speculate given that the election is a year away and the Roll Call data only includes eleven elections. But just for fun, let's project the seat swing based on President Bush's current approval rating of approximately 40 percent. 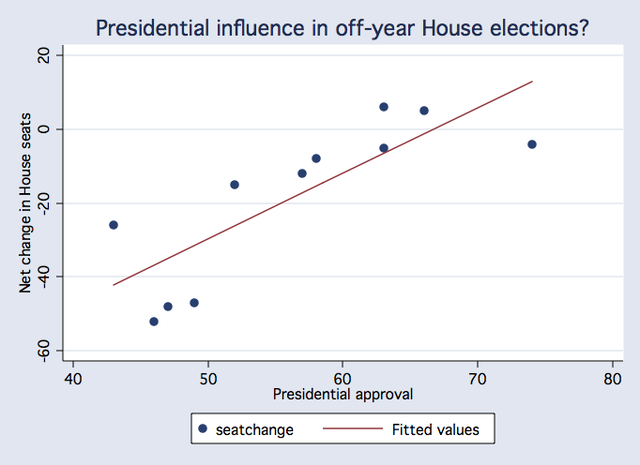 A naive model in which the relationship between presidential approval and seat swings remains constant over time projects that the Republicans will lose approximately 47 House seats in 2006. And under a few different specifications I've tested, the predicted loss is always at least 36 seats, and usually many more. -Clinton in 1994: 46% approval, -52 seats. Even if the relationship between presidential approval and House seat swings has weakened, you can see why Republicans are running scared right now. Update 11/8: For more on GOP fears about 2006 and a series of useful comparisons between 1994 and the current situation, see this Washington Post article. 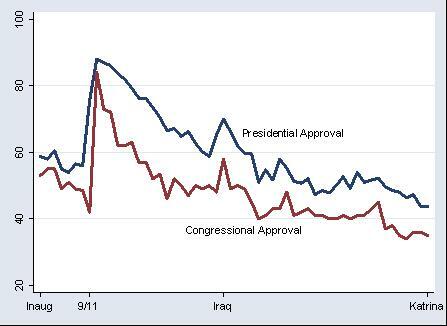 Update 11/9: Westo makes an excellent point in comments about why we careful about extrapolating too much from the Roll Call data -- no president in the dataset has ever had approval ratings as low as Bush's are now going into a midterm election. We're in unprecedented territory. Thank you for this very interesting article. I thought the effect was less pronounced. Got any predictions on Senate races? I know nothing about the political science of congressional voting, but the results look very suggestive. Still, we're extrapolating way off the support of the regression. No president has been as unpopular as Bush, in the data covered by the scatterplot. St. Paul (MN) voters punished Mayor Randy Kelly on Tuesday for standing with President Bush a year ago, denying the Democrat a second term in Minnesota's capital city. ...Former City Council member Chris Coleman, also a Democrat, routed Kelly 70 percent to 30 percent in unofficial returns with all but a few precincts reporting. Ahead of the election, independent polls showed voters were primed to fire Kelly, and most cited his 2004 endorsement of the Republican president as the reason. Yes, but how many seats are actual swing seats these days, given gerry-mandering tactics like those in Texas? Won't this have some effect on the potential impact? dang. i almost blurred my eyes and scrolled over the first graph. so glad i took the time to understand it! extrapolating with my mouse, oh boy is "about 70" an awfully nice number of house seats.